A dry vegetable side dish perfect to go with rice. You can make it with all the three vegetables suggested here, i.e. long beans, elephant yam, and raw plantain or you could cook them individually in the same method. This dish tastes best when Kerala nenthra variety of raw plantains are used but you can make it with other variety of raw bananas also. This dish used to be a favorite and a regular at my paternal ancestral home. I still remember the taste of this dish when my aunt made it. 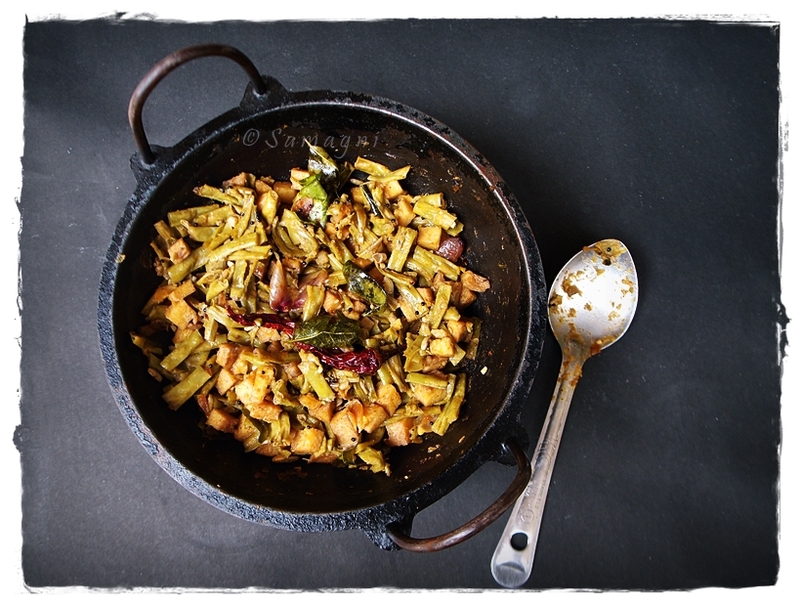 It would taste so delicious with the earthy flavors of the yam and delicate smell of the coconut oil and curry leaves. Since not many spices are used, the taste of the vegetables and the curry leaves fried in coconut oil is predominant in this dish. My aunt usually made this along with pulingari (a dish similar to sambhar) which was a much loved combo. Clean the long beans, cut the ends and chop them to 1 to 1.5-inch long pieces. For beans that are mature (you can identify this from the seeds bulging out slightly), slit them open and use only the seeds. Remove the skin of the elephant yam, wash thoroughly, and cut into 1-cm cubes. Remove the outer skin of the raw plantain and cut into small pieces. Put all the cut vegetables into a pot, add half a cup of water and turmeric powder. Cook in slow fire with a closed lid, stirring occasionally. Once all the moisture dries up and the vegetables are tender, turn off the fire. Heat an iron kadai (this is preferred as it enhances the flavor) and pour oil. Add mustard seeds and once they crackle, add shallots that are lightly crushed using a mortar and pestle. (you can chop the shallots / onion but I prefer crushing them lightly). Onion is optional. You may skip it also. Saute the shallots well. Add curry leaves and chili powder. Mix well. Reduce the flame and cook flame to low,add turmeric powder and red chili powder.Saute for few minutes until all the moisture is absorbed and the stir fry dish is lightly roasted. Turn off the flame and serve with rice. It is koorka season once again. This root vegetable, mostly found in Kerala, is a close cousin of potato, but with much more character and flavor than the mundane potato. Koorka has a very earthy flavor and is very tasty. 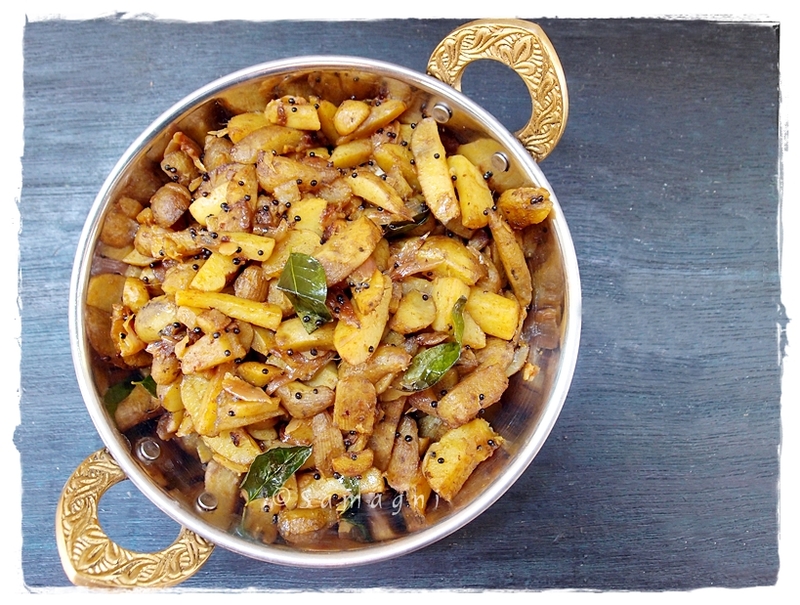 I prefer cooking koorka using minimal spices so that nothing else overpowers its original flavor and aroma. Hence I do not use any garlic or masalas. Many a times we do not even use shallots/onion but just plain koorka cooked in coconut oil along with mustard seeds and curry leaves. The taste is in retaining the unique koorka flavor. Since koorka is small in size and is hairy and muddy, cleaning koorka is a time-consuming task. But there are some shortcuts. The easiest method is to pressure cook it along with water (just like potato) to 1-2 whistles, cool it, and then peel it. Cooking it this way makes koorka soft. Another method is to wrap the koorka in a gunny bag or moderately thick cloth and beat it against a rough stone surface and use your hands to scrape over the cloth so that the koorkas brush against each other. Do this for 5-10 minutes and most of the koorka peels come off. But then again, you will have to clean/remove the leftover peels from individual koorkas and this can be time consuming. Wash and rinse the koorka multiple times until all mud/peel goes off the koorka. Cut it to desired pieces and cook with some water. Personally, I prefer the second method because it retains firmness of the koorka. Wash, clean, and cut the koorka into long thin slices. As mentioned above, you may choose to pressure cook it or peel the raw vegetable and cut it into slices. If you are peeling it raw, make sure that you immerse the pieces in water until you are ready to cook it. Just like potato, if exposed to air, koorka gets oxidized. Immersing it in water prevents discoloration/oxidation. In a pan, add the sliced koorka pieces,turmeric powder, chili powder, and water just enough to immerse the pieces. Cover and cook until water is completely absorbed and the pieces are tender. Be careful not to overcook. Add salt and stir well. Crush the shallots using a mortar and pestle. It is desirable to use mortar and pestle because a mixer would turn it into a paste. The idea is to just crush it to bring out the flavor. Heat oil in a pan, add mustard, and let it crackle. Add the crushed shallots and curry leaves. Saute until the shallots turn golden brown. Add cooked koorka and mix well. If you prefer them crispy, add a little more oil and simmer for about 5-10 minutes until the koorka pieces turn slight golden brown. Serve with rice. 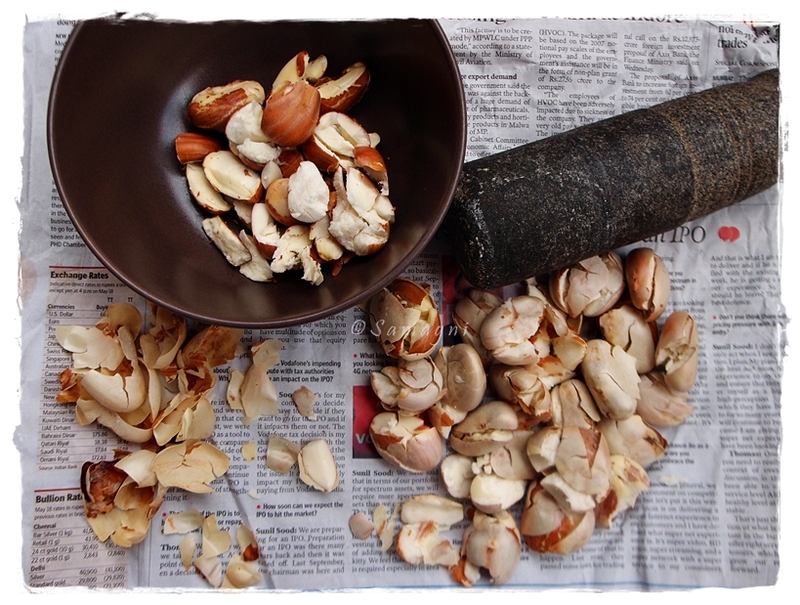 Notes: Cleaning koorka using the second method can make the skin in your fingers dark and a little rough. The easiest way to clean your skin is to apply some oil on your hands and then slowly rub a pumice stone against the affected areas in the skin. You can see the normal skin texture and color return in few seconds. After you are done with all affected areas, wash hands with soap and water.